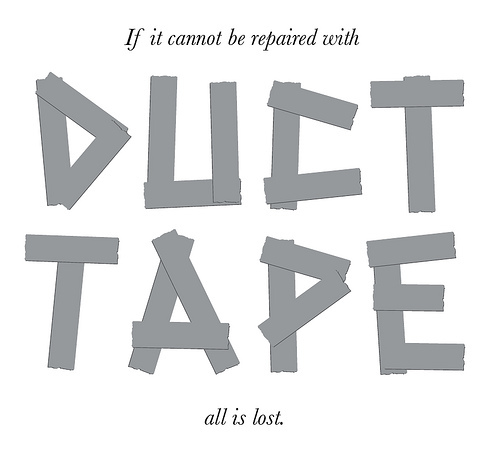 Modern duct tape, the kind easy to tear by hand yet strong and moisture resistant, was developed for use by the US Army in World War 2 to seal ammunition boxes, but quickly became used for many other purposes, including quick repairs of military equipment, weapons, and vehicles. It became widely used by the public after the war, and it remains a popular, and cost-effective means of temporary repair all over the world. 1. Reseal containers of food: Use duct tape to seal up partially opened packages of food. Fold the duct tape over the top of the package, sealing it tight. This also works for cans; just fashion a lid out of duct tape. Warning: this will not prevent the spread of bacteria, so follow food safety guidelines. 2. Stop the leak from a cracked water bottle or a pierced hydration bladder. Duct tape can do the job. Simply dry the surface of the bottle or bag before you try to tape your patch in place, as most forms of duct tape will not stick to wet surfaces. You can also wrap plastic water bottles with duct tape for better insulation as well as to prevent cracks and leaks. 3. Survival arrow fletching. Tear off a few 5-inch pieces, and a long edge of one piece to the arrow shaft, fold the tape lengthwise, and stick the other long edge of that piece to the arrow. Repeat this process one or two more times; trim the vanes to shape with your knife; and you will have a serviceable arrow fletching. 4. Hide your valuables. For smaller items, use duct tape to conceal your items from prying eyes under rocks, or inside a hollow tree. At home, hide your smaller preps under the surface of your kitchen or bathroom counter, affixing it firmly with duct tape. Be sure to remember where you left it, however. 5. DIY Flypaper: Roll off a few foot-long strips of duct tape, hanging them from the top inside roof of your tent, or from your cabin rafters. No mess, no stress, and no nasty chemicals, either. Plus, you will have some extra bits of protein gathering for your meal if there is no other food available. 6. Create butterfly bandages. Cutting two small strips of DT, add a smaller strip across their centers (sticky side to sticky side) to create a makeshift butterfly suture. 7. Patch a hole in canoe. Using a solid piece of bark, metal or plastic as a patch, seal it firmly on both sides with duct tape, making an interweaving pattern for added strength. 8. Stabilize a broken ankle or leg with ample splint material, padding and duct tape. Pad the joining of a forked branch with some cloth and duct tape to fashion a quick crutch to go with your splint. If you trip and sprain your ankle, wrap the ankle with duct tape to give it some support. 9. Hang perimeter lights: String glow sticks around your camp with a duct tape rope, or hang them from tree branches. 10. DIY belt: Don’t let sagging pants pull you down as you bug-out. Run a strip of duct tape through your belt loops, and cinch up those pants with a final tug, securing the duct tape to itself. It will still come apart easily enough when necessity strikes. 11. First aid sling. Fold a length of DT down the center, so that it is half the width and no longer exposes the adhesive side. Bring it into a large loop which you can comfortably hang from the back of your neck down to your chest, and rest your injured arm inside. Add additional lengths to stabilize it for more protection. 12. Leave a waterproof note. Write on it with a Sharpie, or use strips to form letters. 13. Emergency restraints. If someone poses as danger to you and your group, duct tape their hands together around a tree until a more permanent solution can be decided. 14. Mend rips and tears in your clothing by slipping a piece of tape inside the rip, sticky side out, and carefully pressing both sides of the rip together. The repair will be barely detectable. You can also hem your pants with a strip of duct tape. The new hem will last through a few washes too. 15. Repair your glasses. If the frames break, a thin strip of duct tape will keep them together. Young Harry Potter approves of this method. 16. Fashion a shelter. Using trash bags and some duct tape, or even better, taping two survival blankets together, you can create a roof for your lean-to, a sleeping bag cover, or a wind break. 17. Attach survival gear. Tape a spark rod to the side of your knife sheath, and you’ll always have a back-up fire source. 18. Insulate in your boots: Make your winter boots a little bit warmer by taping the insoles with duct tape, silver side up. The shiny tape will reflect the warmth of your feet back into your boots. 19. Make a rope. Twist one or several lengths of duct tape into a cord or rope. This can be used as clothesline, as well. 20. Make a hat. Protect your head from the sun or loss of heat in the winter by forming a hat using multiple strips of duct tape. Get creative! 21. Weatherize your clothes: Lining the outside of your coat and pants thoroughly with duct tape may look tacky, but it will effectively make it water resistant and keep you dry. 22. Wrap bandages. Placing a sterile dressing such as medical gauze over your wound, strap it in place with duct tape. 23. Repair your rain gear. Keep the dry stuff dry by mending your ripped rain gear with a few strips, inside and out. 24. Make a drinking cup. Some creative folding and sticking can result in a cup you can drink from. 25. Hurricane or Pandemic seal. Create a quarantine room with duct tape and plastic sheets around windows and doors. Seal or strengthen windows for hurricanes (or home defense) with duct tape by making large X shapes to help contain shards of broken glass. 26. Make a spear. Cut a branch about 3 -6 feet long, and strap your knife to it with duct tape, and you have a spear for hunting, fishing, or defense. 27. Insta-sheath. Make a sheath for your knife out of duct tape – make sure to double stick the tape so the inside around the knife does not stick to the blade. 28. Blister protection. Cover the affected area with a bit of cotton gauze, and tape over the cotton. Make sure that the duct tape fully covers the cotton and does not touch the blister. 29. Mark your trail. Tape strips to branches or bushes at chest height to leave a trail or signal for rescue, especially if your DT is brightly colored or reflective. 30. Make emergency repairs on your Bug Out Vehicle. Patch up leaking hoses, seal windows that won’t stay up and cover bullet holes with strips of duct tape. 31. Keep the stuffing in your goose-down sleeping bag. All that warm insulation will quickly become useless if its scattered all over the floor. Simple repair: patch the hole with duct tape. 32. Tent Repair: A broken zipper could leave your tent door flapping in the wind, leaving you exposed. Seal the door shut, and keep the critters out. Have a hole in the tent fabric? Cover the hole with a patch; for double protection mirror the patch inside the tent. You’ll keep insects and weather where they belong. 33. Broken tent pole or fishing pole? No problem. Create a splint by taping a stick to the broken area of your tent pole or fishing rod, and you will be able to use it until you are able to replace it with another.